One of the first things you notice about Sarah Brightman is her laugh. It’s genuine, it’s infectious, it’s happy. And why not? The world-renowned singer has a lot to smile about these days. In November, the 58-year-old pioneer of the classical crossover music movement will release her latest album, Hymn, and embark on a two-year world tour with a whopping 125 concert dates (including stops in Toronto, Montreal and Vancouver). Famed for possessing a vocal range of more than three octaves, she’s also the only artist to have simultaneously topped the Billboard dance and classical music charts and has more than 150 gold and platinum awards under her belt. A lot to smile about, indeed. Brightman’s natural zest for life is all the more apparent when she answers the phone in Hamburg, Germany, with a cheery greeting and inquiries about how I’m doing, where I’m calling from and what the weather is like outside. Brightman, who describes herself as “an interpreter of music,” started her career on the stage (including originating the role of Christine Daaé in the original London production of The Phantom of the Opera), before ultimately making the transition to a solo performer and tackling various genres. However, her dream of flying — and singing! — in space as part of the Russian Space Program fell apart in 2015. (After months of vigorous training on Brightman’s part, the $52 million, 10-day trip aboard the International Space Station was postponed indefinitely due to personal family reasons, according to reports.) Although Brightman didn’t get to fly to the moon, the space odyssey that never was ultimately motivated her to reunite with longtime producer Frank Peterson and record Hymn, her 12th studio album. The album, filled with spiritual choral music and an English language version of her smash hit “Time to Say Goodbye” (which she originally sang with Andrea Bocelli), hinges on the concept of togetherness during times of global turmoil. Here, Sarah Brightman tells us how her latest album, Hymn, came together. LAURA GRANDE: Hymn features a lot of choir-based spiritual songs. What inspired you to go in that direction this time around? SARAH BRIGHTMAN: When I think back on all my albums, I find there’s always been a good reason for why I’ve done a certain theme — and it’s usually something that has recently happened in my life or a journey I’ve taken. For this album, I had recently come out of the Russian Space Program and needed to “earth” myself again. To help really get myself back into singing, my producer Frank Peterson called me and said, ‘I really think you need to start working again. What’s coming to mind?’ I said, ‘To tell you the truth, I’d like to work on pieces which are full of hope and light and I want to work with a lot of human voices — meaning choirs and things that make me feel safe and familiar. I’d been reading newspapers and looking on the internet and the world felt a bit dystopian at times. So, the type of album I wanted to do was something that made me feel great and — for those who care to listen to it — other people as well. So I chose some really positive pieces. LG: What does the word “hymn” mean to you? SB: If you look in the dictionary, it will say it’s a collection of spiritual music that humans sing together in a temple or church. But, for me, when I think of the word “hymn” I think about the preciousness of life. It can be the humming of crickets, bird song or humans singing together. It can be the sound you hear when you listen to the trees and the rivers, and everything that is beautiful and positive on this earth. That’s what it means to me. LG: Tell us about your longtime partnership with producer Frank Peterson. What is it that makes the two of you collaborate so well together? SB: Probably because we argue our points. It’s quite exhausting at times, but it seems to have a good effect. I think we come at things from very, very different perceptions. I’m not saying that we’re Lennon and McCartney — because we’re not — but these relationships between writers or partners in the entertainment world often come from opposing places. The journey is quite difficult at times, but it creates the most interesting results. I think that we have different tastes in music but, in the end, we always follow the same route and come together. LG: How do you decide whether you’ll sing a song in English or its original language? SB: I usually prefer to sing songs in their original language because when you translate them, it’s never quite the same. You don’t get that same texture. So, when I look at this album and [the re-release of] “Time To Say Goodbye”, I think the reason I wanted to sing this particular song in English is because — in all my years of singing the piece with Andrea Bocelli — what the audience gets is this feeling of grandness. But the subject, when you really go into the lyrics, is actually incredibly intimate. [Singing] the lyrics in English adds depth. LG: You’re about to head out on tour for two years. How do keep the passion going on such a long, whirlwind tour? SB: I think we all [experience] some days when we don’t want to be doing whatever it is that we’re expected to be doing. But as you go through the day, things around you can inspire you and keep you going so that, in the end, you’ve actually enjoyed yourself. The audience is always inspiring to me. They go through all that trouble of paying for their tickets and taking the time to come see an artist and enjoy the moment — that makes me feel very privileged. That in and of itself gives me adrenaline even when I’m tired. LG: Do you have any tricks or remedies to help maintain your voice, especially while on tour? SB: Well, it’s one of the reasons why I take a lot of time in between tours. I think that, by the time I get through a tour, I’m in a very strong and secure place — both with my voice and metaphysically. During the tour I take everything day-to-day. Whenever I panic slightly about my voice, I remind myself that, for years, I did eight shows a week [in The Phantom of the Opera] and worked with many brilliant opera singers, like Plácido Domingo who is in his 70s and is still running around the world doing performances. I think that human beings, if we look up to ourselves, can get through amazing things. LG What songs from Hymn are you most excited for fans to hear? SB: There are a couple, actually. I was very interested in the song “Miracle” because it’s a modern classical piece written by a very famous rock star from Japan called Yoshiki. He is just as big as Freddie Mercury would have been, or David Bowie. I got to know Yoshiki while filming the  movie Repo! The Genetic Opera, which I filmed mostly in Toronto. So, for Hymn I asked Yoshiki if he was working on anything that would suit this album. He said he had a piece written for a choir and it came out absolutely beautifully. There’s also another piece I love from the album called “Fly to Paradise.” Eric Whitacre, who is considered the new kapellmeister (“choir master”), had written for a musical called Fly to Paradise a few years back. It’s probably one of the best pieces on the album. LG: What’s your favourite song to sing live? SB: Ohhh! [pause] You know, I love to sing Mozart’s “Hallelujah.” That’s a beautiful piece. I’m also a real sucker for Puccini. I’ve always loved “O Mio Babbino Caro.” It’s the piece that made my father cry when he was alive, so it’s very close to my heart. 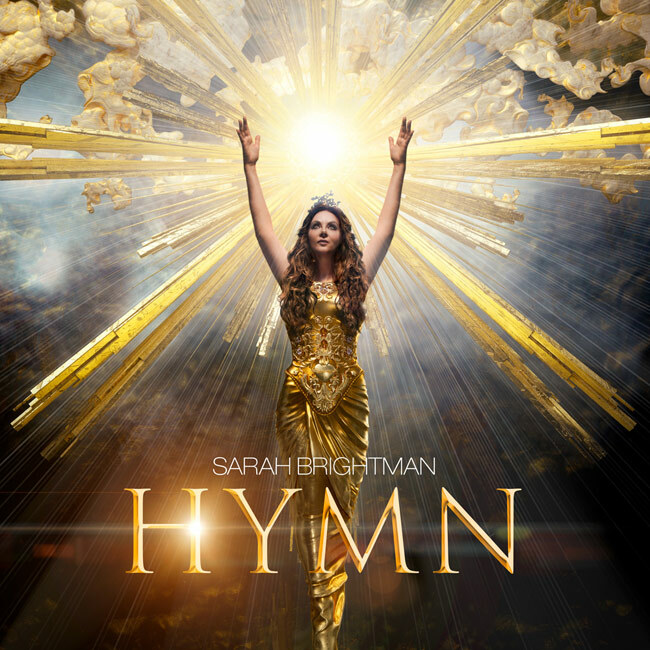 Sarah Brightman’s Hymn is available in stores on Nov. 9 and her two-year world tour kicks off on Nov. 24.